Here are the musicals with songs I've loved from beginning to end. 1. 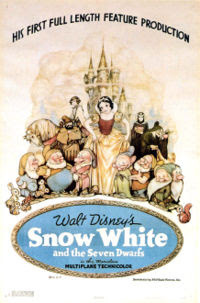 "Snow White and the Seven Dwarfs"- My first Disney favorite.I watched my betamax copy that I got from my mom like a million times as a kiddo. I kept on mimicking the "I'm Wishing" song complete with the echo. 2. 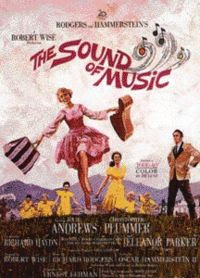 "Sound of Music"- I remember my Mom brought this and in VHS format. We couldnt watch it because we don't have the player then. Haha! I was able to watch it in school. 3. 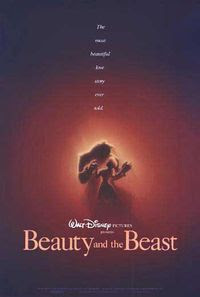 "Beauty & the Beast"- I watched this on the bigscreen. It usually takes months before they show movies in the province. And it's doubled with another flick, so we stay glued in the seats for 4 hours. 4. 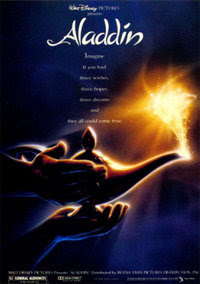 "Aladdin"- I think we got this from my mom. I kept on hitting "pause" at the part where Aladdin's and Jasmine's lips met for their kiss. 5. "Evita"- When I was a kid I took this random cassette tape from my mom and then transcribed these two sings that I liked "Good Morning Sunshine" and "Don't Cry for me Argentina". 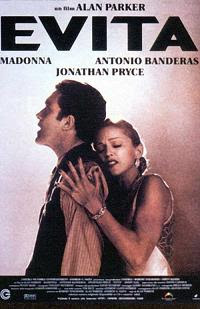 After many years I fell in love with the Evita soundtrack I borrowed from Arni's mom and heard the latter song again. I watched the movie just by myself. A highschool kid watching alone and singing all throughout the movie. 6. 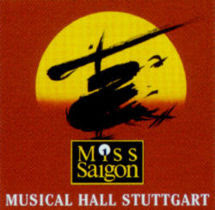 "Miss Saigon"-I first heard the soundtrack on a one summer vacation at my Uncle's place. Years passed, I landed the part of Yvette in our highschool musical. My last phone conversation with my mom was that she's willing to let me watch the "Miss Saigon" which was running in Manila. She passed away a few days afterwards. I haven't had the heart to watch it then, but I vow to see this someday. 7. 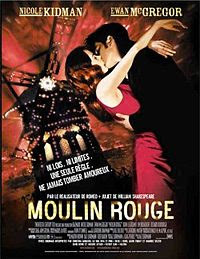 Moulin Rouge!- This movie is one my all time favorite. I always think that if my mom was able to see this she would have loved it. Musicals reminds me of my mom. I miss her.